Deep-X100, 3/8oz compact deep crank bait, now is equiped with LBO2 linear bearing oscillator system to move weight at lowest friction. 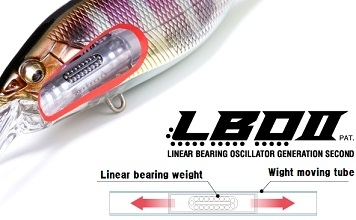 Due to the LBO2 system, it flies 20% more distance, and it starts wobbling actions just immediately after you pull lines. Deep-X100LBO makes high-pitch rolling actions. Dives up to 2.5m 8ft.